About once a fortnight I get a request for emergency funding from one of our field offices. These requests typically relate to events that affect between 50-100,000 people, with minimal deaths (less than 50), and are often either weather related (floods/droughts) or minor earthquakes. In the last week, there have been requests for support to people affected by Cyclone Laila in India, monsoonal flooding north of Colombo in Sri Lanka, and the flooding of a major river system in Somalia. And those are just the ones in my portfolio. In fact, at any one time there are dozens of emergency responses going on. Right now, for example, we’ve got the follow-on from recent bigger emergencies, such as the earthquakes in Haiti, Chile and China; ongoing protracted responses to conflicts in places like Darfur, southern Sudan, Democratic Republic of Congo, northern Sri Lanka, Pakistan, Afghanistan, Gaza and the Caucasus region of southern Russia; food responses across the Horn of Africa, Western Africa and Southern Africa; emerging slow-onset emergencies such as the food emergency in Niger and the response to the harsh winter in Mongolia; and the long-term follow-up to disasters like Cyclone Nargis in Myanmar, the Sichuan Earthquake in China and the Padang Earthquake in Indonesia. Three times a week our office produces a daily digest of current emergency-related issues relevant to our work as pulled from global media. This morning’s listed 17 different items, a pretty standard number. I also received our monthly early-warning brief for the Asia-Pacific region. There were more than 45 seperate issues listed as building concerns or events in the region. In short, there’s a lot of emergency traffic going on. Never mind the two or three appeals you get through your letterbox each year. We all heard about the Haiti disaster. But there’s stacks more out there to which humanitarian agencies need to be aware of and, in many cases, want to respond to. The challenge, though, is how best to do-so. We have limited financial, human and organizational capital to draw on. When big high-profile emergencies such as Haiti occur, we can raise lots of funds from governments and the general public, but it’s impossible to do-so on a weekly basis to respond to all the minor emergencies that come along. We face what’s called ‘donor fatigue’. Repeatedly asking people to give to emergencies taxes their goodwill and their limited financial resources, and ultimately runs the risk of turning them off to giving altogether. In the same way that aid workers often become desensitized to violence and tragedy due to overexposure, we risk numbing the hearts of the general public if we hound them every five minutes for yet another crisis. What to do then? Well, some agencies are able to raise what we term ‘non-designated’ funding, that is, pockets of money that is not tied to a specific location or emergency event, which we can contribute at our own discretion where most needed. But such funds are, sadly, hard to raise. Most people give because of specific triggers- such as a disaster they’ve seen on the news which they are moved to sympathy by. It’s much harder to encourage people to give ‘on principle’ and trust agencies to make the decision about where that money should be directed. That’s not a criticism, just a reflection on the reality of donorship. To some extent, agencies themselves bear the responsibility to educate the giving public to change these behaviours. The practical reality is, no agency can respond to all the need out there, and disasters have to be ‘triaged’. We can respond to this one over here, but not that one over there. How do we decide who benefits from support and who is ignored? Ultimately, we need to be using the Humanitarian Imperative to guide this- that is, where are the greatest levels of need? Pragmatically, this is difficult (and costly) to measure empirically. It is more often, which implementing office can put forward a more compelling argument, and which offices have the capacity to do a better job with the money we give them? It can be hard to compare like with like across continents and across emergency types. State capacity also plays a part here. Aid agencies aren’t lining up to help shrimp fishermen in the Gulf states of the US because, although they face a real economic need due to the human-made disaster of the BP oil spill, there are structures like insurance, recourses such as the court system, and a highly functional and wealthy government with a history and precedent of supporting its people when faced with difficulty (and sure, the US government might have its shortcomings, but when you compare it to the governments of Somalia, or Myanmar, they come out looking pretty good). NGOs mustn’t undermine a state’s sovereign responsibility to help its own people when in need. But where states don’t have the ability or the will to intervene, there is a higher onus on agencies to step in. Finally, agencies employ long-term development programs with a risk reduction element. Communities living in areas where disasters are commonplace and cyclical (drough and flood cycles in sub-Saharan Africa, for example, or monsoonal storms in south Asia) are provided with tools and training to manage their own risk environment- that is, to identify the threats they face, and put in place measures to reduce those risks. Those might include growing more drought-resistant crops, or building raised cyclone shelters, or moving houses away from slopes prone to landslide, or creating village-level micro-insurance systems, or storing next season’s seed on raised platforms where seasonal flooding won’t ruin them. Anything to make communities more resilient to these regular disasters. Risk reduction activities take time to implement, and longer to bring about behaviour change in at-risk communities. And, like I’ve mentioned above, we can’t be everywhere, nor can local-level activities mitigate against larger disasters. So our dilemma remains. Myriads of emergencies, and only limited resources. It’s a daily tension in my job. Who do we help, and who do we turn away? Any thoughts on how to manage this situation from an organizational perspective are most welcome. 1. 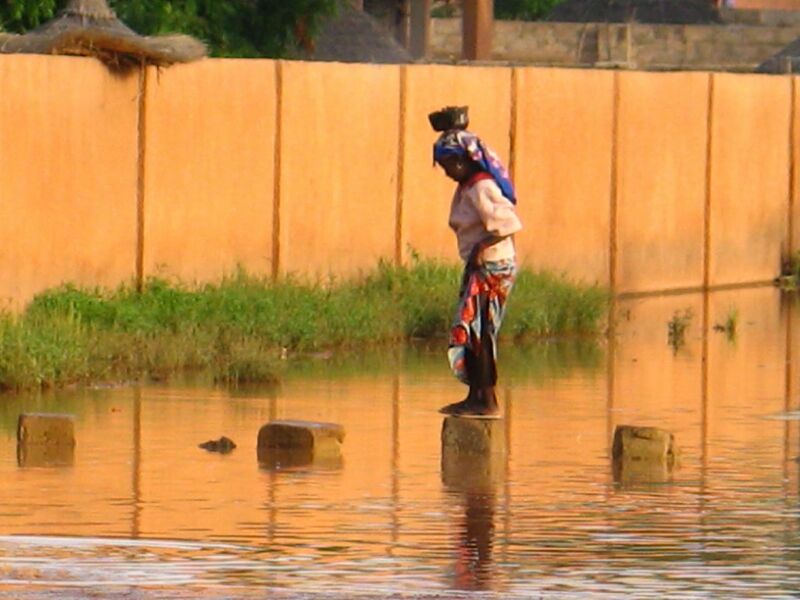 Maradi Flooding: A small girl uses stepping-stones to cross a flooded street in the central Nigerien city of Maradi. Rainy season storms routinely flood streets and houses, and wash out roads and bridges, in Niger and across the Sahel, displacing hundreds of thousands of people a year in many small events. 2. 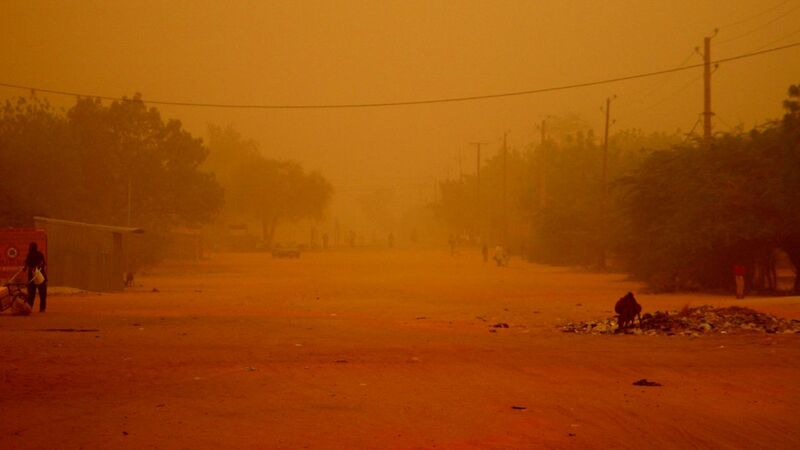 Dust Storm, Niger: The same city, nine months later. And nearly nine months has passed since the last rains. Winds whipped up by cyclonic systems cause intense dust-storms that damage homes and crops. Drought itself brings economic hardship and food insecurity to millions of households in pockets across Sub-Saharan Africa annually, and to many children, death. I’ve always been a bit of an environmentalist. From a very early age I’ve had a thing for the rain-forests, and later, a desire to be environmentally concious and relevant. I guess going through grade school in the 1980s meant that I imprinted a whole lot of those social awareness messages- especially growing up in Geneva and surrounded by the UN and other international organizations. At university I studied environmental issues in depth at both undergraduate and postgraduate degree levels- right down to examining journal articles analysing ice-core samples, pollen records and isotopes found in the shells of prehistoric crustaceans. So when ‘An Inconvenient Truth’ was released to much global chatter ten years later, I didn’t learn anything I hadn’t already concluded from the research I’d dissected years earlier. That said, being convinced of the need for humans to be environmentally courteous, it’s still a challenge to know how to do this. Trade-offs abound. Hidden costs are everywhere. I recycle. In the past I have tried to exist without much use of a car (though living in the sprawling suburbs of a city with a rotten public transportation network- Melbourne- this has proved extremely impractical now). But I’m also aware that for my job I travel vast distances by airplane, and this probably puts me into the more pollutant-contributing members of our species- a fact I try to justify through what I do, but the fact remains. Water is a huge issue. It ranks as the second most essential ingredient for human life to continue, after oxygen. It is an extremely limited commodity which is being depleted globally, and the worldwide distribution of which is being negatively impacted by changing climate patterns. It has long been predicted that future conflicts will be driven by the struggle for control over clean water resources. The state of Victoria, where I live, has been struggling with drought for over a decade now. 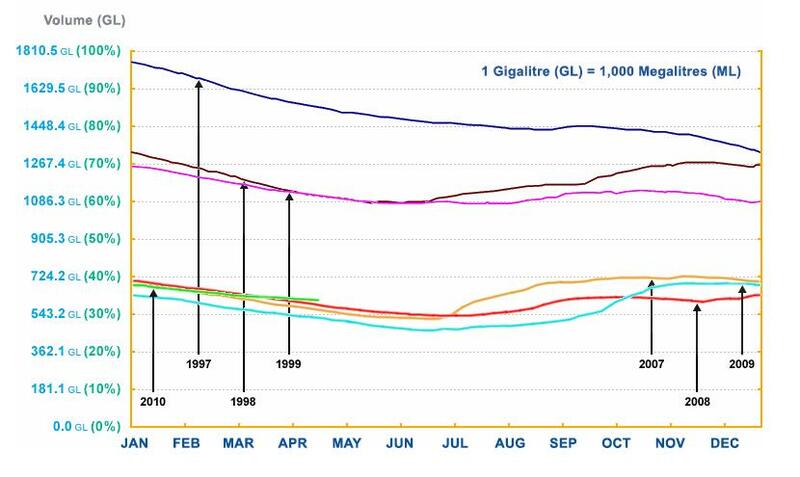 In this interactive graph provided by Melbourne Water, you can see how water levels in dams and catchments have fallen from the period 1997-99 (top 3 lines) to the period since 2007 (bottom 3 lines). We are in city-wide water restrictions at Stage 3, which restrict activities such as watering gardens, using hosepipes, washing cars and filling pools (watering gardens, for example, can only be done twice a week on designated days, using a watering can; cars cannot be washed, except for spot-washing of windows and mirrors where visibility is being affected, using a bucket and sponge). I have always tried to do my bit. Campaigns call for 4-minute showers, and as a guy I don’t find this hard to comply with. I find I can’t take a shower now- anywhere- without mentally keeping a check on how long the water is running for. I see the value in water and I do want to conserve it. My struggle has been wondering how much difference this sort of choice makes. I have always been sceptical. For example, it’s all very well if I restrict my water usage, or even if all households in Melbourne restrict their usage and cut back, but what sort of a difference do we make when there’s no evident transparency around the amount of water going into, say, agricultural irrigation schemes, or industrial production. In my mind, it was quite possible that 80% of the available water was going into these other things, so unless work was being done to curb water use in other economic activities (which, of course, I could see as being highly unlikely politically due to desires to maintain economic throughflow) then my efforts might very well be the proverbial drop in a bucket. I did see a statistic at one point that suggested that household water usage accounted for about 50% of state-wide water consumption, against agricultural and industrial production. This made me feel a little better. I could see the value then in making some personal sacrifices. After all, every litre saved is a litre in itself and has value. Having lived and travelled extensively in the third world, having watched people queue for eight hours to fill up their buckets, or women and girls spend hours each day gathering water to survive, I understand how precious each of those litres are. Heck, I’ve done my time washing out of buckets on a couple of litres a day. I get it. But at the back of my mind has always been the hidden environmental costs that go into every facet of daily life. It crops up in a variety of ways. For example, when you buy a product that’s come from overseas, it’s been transported at an environmental cost. Has it come by plane? By sea? What about the various components that went into it- did they also travel to a point of manufacture? And the packaging? Without a detailed environmental audit of every product (someday I hope to see this on packaging much like we take nutritional information for granted today), it’s impossible to tell. Good examples of this are organic foods. Touted as better for the planet, in fact this isn’t strictly true. Yes, they reduce the amounts of chemicals we’re pumping back into the soil. But in fact, the earth doesn’t have enough fertile land area to be able to produce enough food using strictly organic techniques to be able to feed our burgeoning population. If we converted all available land to grow organic foods and stopped polluting with chemical fertilizers, pesticides and other agents, tens of millions of people (and more) would rapidly starve to death- because in fact those pesky chemical fertilizers do vastly increase the yield of food per hectare that we can produce. Trade-offs. Another example is ethanol fuel. It’s plugged as an environmentally friendly alternative to gasoline, and is mixed in with regular gas as the ‘green’ option on the forecourts. However the processes behind ethanol production involve vast amounts of land area converted to sugar-cane. Demand for ethanol is accelerating the destruction (by fire) of the Amazon rainforest in Brazil and the commercial exploitation of the residual infertile land for sugar-cane farming is devastating the soil quality, resulting ultimately in unsustainable practices, poverty traps for small farmers, and desertification. It is, in the long term, horrible for the environment, and I’ve stopped putting ethanol into my tank as a result (although the whole thing is a trade-off; which environmental cost is higher per litre of fuel- burning down rainforest and desertification, or pumping out higher levels of carbon fumes from my exhaust? It’s not easy to find out). I was both fascinated and chilled to read a story last week on the BBC website about water use in Britain and how water use in developed countries was creating shortages in the developing world (not the story itself; that’s old news. But the details within it). They had taken just one resource- water- and applied exactly the above thinking to it: What is the hidden cost behind the products we take for granted? They call it “embedded” water usage- namely, how much water goes into producing said item- watering the crops that are the raw material, washing goods ready for commercial availability, involved in chemical processes, etc. There is an awesome interactive graph (yes, I like these things), and it displays per unit, and per kilo of product. An example. A single sheet of paper takes 10 litres of water resources to produce, while a kilo of paper, around 2,000 litres (think about that the next time you by a ream of paper for your printer at home). For reference a bathtub takes on average 150 litres to completely fill. Melbourne’s household water target per person per day is 155 litres (and water statements here now come with little graphs showing how close your household water usage has been over the past quarter to that target). Another example. A loaf of bread takes about 440 litres. Per kilo, bread requires about 1,000 litres. Or take a cup of coffee. To make a single cup of coffee, 140 litres is required. Think about how little actual coffee goes into a mug- just a few dark grains at the bottom of the cup (or jammed into the espresso machine). To make a kilogram of coffee- get this- the report says it takes 21,000 litres. 21,000!!! When you see those lovely-looking 10kg hessian sacks of smooth polished coffee beans sitting by the counter at your local Java-juice dispenser to add a little ambience and authenticity, consider the fact that it took 210,000 litres of precious water just to produce that one sack. In perspective, that’s about what a thoughtful household in a western country might use in a year. It’s also the volume of a moderate sized swimming pool. 10kgs. It’s crazy. Here’s one more. Jeans. This one freaked me out. To make a single pair of jeans- get this- it takes 10,500 litres. For one pair! This kills me! I never want to buy a pair of jeans ever again! And I like jeans! I have a good buddy who works for Levi’s here in Australia! But I can’t get over this number. It’s mind-blowing stuff. Anyways, that’s my rant for the day. Hopefully not too much doom-and-gloom in there. But at the same time, hopefully something to think about the next time you buy something. And in all seriousness, I can’t wait for the day that all our commercial products have environmental information printed on them, just like today we can read the nutritional information. If we want to keep not just our bodies but our society and our world healthy, I think this is absolutely critical. 1. Fill: A Haitian man fills a water container from an NGO-installed water-point on the island of Gonave, off the coast of Port-au-Prince. 2. Industry: Steam billows from an industrial smokestack in western Melbourne. 3. Stain: Saline water stained brown flows out into the sea in northern New Zealand. 4. Outback: Australia’s outback landscapes support it’s moniker as “The Dry Continent”- the most arid landmass on the planet. 5. Stage III: Hosepipe bans and garden watering restrictions are hallmarks of Melbourne’s Stage III water restrictions. 6. Gathering Water: Haitian women and children gather at an NGO-installed water point to collect water. 7. Shade: A boy shelters from the burning midday sun in the Sahelian drylands of southern Niger during the 2005 famine. 8. Therapeutic Feeding Centre: An infant waits to be registered at an NGO-run therapeutic feeding centre for severely malnourished children during the 2005 famine in Niger. 9. Stream: Steam blows from industrial smokestacks, western Melbourne. 10. Pouring Water: A Nigerien girl fills clay jars of water from a deep well. Girls and women in Sahelian Africa spend many hours of each day gathering water for their households- first hauling the heavy liquid up from wells and bores, then transfering it to pots which they then carry back to their homes one by one. To see more of my photography please check out my Gallery here. In the next day or two, non-governmental organizations expect to begin mass food distributions to earthquake survivors in Haiti. They’re planning to do this in conjunction with military support- specifically, the US Marines and the United Nations Mission in Haiti (MINUSTAH). It’s taken more than two weeks to organize. I’ve explained some of these reasons elsewhere. In short, the logistics of trying to organize food distributions to hundreds of thousands of people simultaneously is an immense undertaking. As well as importing and moving that amount of food (food is heavy stuff), there’s the matter of locating and organizing distribution sites, coordinating dozens of agencies, working through broken infrastructure, communicating the details to the residents of Port-au-Prince, and trying to define the relationship between the military and aid agencies. The interaction between the military and NGOs has long been a contentious one, and the controversy has only snowballed over the last decade. It can seem like an academic discussion. Who cares about soft issues like ‘humanitarian space’, ‘independence’ or ‘identity’ when lives are at stake? Compromising meta-level ideals in a short-term response is part of the aid business. A colleague of mine has defined it as the balance of ‘Pragmatism versus Principle’. It happens every time we run a response. Maintaining principles in the face of complex realities is not always achievable when lives are at stake. In Port-au-Prince, the argument hinges on security. Reports and rumours of insecurity (see, for example, today’s news from Reuters Alertnet) make aid workers on the ground rightly sceptical about waltzing unprotected into the middle of Port-au-Prince with a truckload of aid supplies. They make a tempting target in a desperate city that was until recently one of the world’s kidnap capitals, and where 4,000 prison inmates escaped when in Biblical fashion their cells were broken open during the quake. Tempering this, of course, is the recognition that in any disaster aftermath, the stories that get picked up are those of things going wrong, not right. The media jumps on tales of woe, from the stumbling coordination of aid to the voyeuristic fascination with violent mobs of survivors seizing food by force. These stories can skew a context to appear worse than it really is. Wise and tempered words from a man at the pointy end of the Civ-Mil debate. They give us balance, and remind us not to dehumanize the vision of an angry mob. Whatever the Haitians’ reaction in the face of grief, fear and need, these are the human beings we as aid agencies are here to help. The debate on how NGOs should engage with the military, however, is a fierce one. Balancing what needs to get done, with doing it the right way, has vociferous proponents in both sets of trenches. Here’s a bit of a summary of the argument. Logistics. The military do this well. They have hardware- trucks, choppers, transport planes, landing craft, armoured bulldozers (cool)- and they know how to use them. An army marches on its stomach, or in this day and age, its fuel tank. The success or failure of a military operation depends on its ability to supply its frontline troops with food, ammunition, weapons, fuel and parts, without which even the most highly-trained forces in the best-conceived campaign will grind to a halt. Look to Hitler’s Panzer divisions in Western Europe and North Africa whose advances were so rapid that they left their logistics tails far behind them, with disasterous results. If you absolutely, definitively, imperatively have to get a whole load of stuff moved from A to B in a hurry, call the Marines. Security. Aid workers don’t carry guns. In fact, aid workers are actively discouraged from carrying guns (precisely so they’re not confused with military personnel- and so they don’t accidentally shoot beneficiaries- or themselves). Most NGOs have very clear guidelines around the carriage of firearms and the hiring of armed guards for security purposes. The logo of an AK-47 with a red line drawn through it is one of the most recognizable symbols of international charities in war-zones around the world, stamped on the side of every white Land Cruiser in sight. Soldiers, however, do carry guns, and spend much of their career learning how to fire them properly. Valuable and vulnerable aid supplies can be easy pickings for armed gangs- and have been targeted by violent men for as long as there have been relief responses. Both for the supplies and for the people delivering them, there is a comfort in knowing the cavalry is close at hand. Site Organization. Setting up a perimiter is second nature to military forces. Distributing food to thousands of people at a time is a complex affair which requires careful site management to avoid panic, crushes, security incidents and chaos. Nothing quite says “behave yourself” than a platoon of green-clad soldiers with M4 Carbines and kevlar helmets. Communication. Getting hundreds of thousands of people to arrive simultaneously at a bunch of different distribution sites across a city takes some serious coordination, and some pretty solid information flow. Military forces have communications gear, personnel and vehicles handy to be able to spread this message. Decision-Making. NGOs are consensus-driven beasts. Getting a rapid decision out of just one NGO can be like squeezing milk from a railway girder. Put twelve of them in a room together, well, those of who who’ve ever been in a UNOCHA coordination meeting know what I’m talking about. You don’t normally have this problem with the army. When they want something done, they tend to get it done. Envy. Because let’s face it, pretty much every male aid worker out there at one time or another thought about being in the army. And those armoured trucks with the self-inflating tyres are AWESOME. Identity. The “N” in “NGO” stands for “Non”. As in “Non-Governmental Organization”. Militaries, by contrast, are every bit governmental organizations- however they may present themselves. No army deploys without the consent and instruction of its government, and no government deploys its most valuable military assets without having something to gain. The Red Cross Code of Conduct is an internationally-recognized agreement between international aid agencies which outlines how organizations should operate in an emergency. Point 4 of the 10 guidelines states “We shall endeavour not to act as instruments of government foreign policy”. Working alongside military organizations, however ‘humanitarian’ their mandate may appear, compromises this code. Fear. Guns and uniforms trigger a response in almost anybody. Sometimes that response can be a reassuring one, such as the sight of armed officers at airports to protect from hijackers. However that argument comes from a Western worldview where the military and the police are well-behaved, disciplined and highly trained. In most disaster-affected countries that NGOs respond in, militaries are not. They can be violent, abuse their power, are poorly disciplined, and often represent either themselves, or a particular minority of the political spectrum. This is certainly true in a country like Haiti. Having armed soldiers at a distribution point, far from being reassuring, can trigger fear in aid recipients. We don’t want this. These are not cattle. They are survivors and the families we are trying to help. Trust. NGOs operate on trust, and it’s a fragile currency. We spend years building relationships with communities. We maintain impartiality so that we can deliver aid to people who need it on both sides of a war-zone, often garnering respect from both parties, able to cross front-lines and in some instances, acting as mediators between fighting groups. When it works well, it means we can travel in areas of conflict without military escorts and without worrying about being attacked (although, admittedly, those days are waning). When we engage with military actors, our message to our beneficiaries is, “we don’t trust you not to hurt us”. This is not respectful, does not treat the recipients of our assistance with dignity, and compromises their ability to trust us in the future. Worst-case Scenario. What if something does go wrong? What if an aid distribution gets rowdy and military personnel feel compelled to use deadly force to protect themselves or the aid supplies? The first tragedy is that somebody has been killed instead of helped. Furthermore, if members of a crowd get shot during an NGO distribution, the crowd that witnesses that (and any media who happen to be filming at the time) will associate that violence not just with the military, but with the NGO running the distribution. Will that NGO ever be able to work with that community again? Global Messaging. The era of CNN has peaked. The first point of contact for instant breaking news is no longer news websites, but sources like Twitter and text message. In-depth analysis is still carried out by edited publications like the Guardian and the New York Times, but people increasingly refer to unaccountable blogs (like this one) that can say whatever they feel like. Information can travel from one corner of the world to the other in seconds, and be re- (and miss-) interpreted as it goes. Images of NGO X working in Haiti alongside US Marines can end up on a computer terminal or cell-phone in northern Pakistan, Afghanistan or Indonesia, and that NGO be identified as an extension of US foreign policy. Staff of NGO X in Pakistan, Afghanistan or Indonesia are then tarred with the same brush, and put at instant risk. The loss of trust is no longer local, but global, and has both operational and security implications. Rules of Engagement. Military forces have often engaged in assistance missions to populations affected by war or disaster. However it’s important to realise that soldiers are trained to fight and to kill first and foremost, and that is the raison d’etre of any army. The US Army didn’t equip its AH-64 Apache gunships with Hellfire missiles so that they could provide aerial guidance for aid convoys driving through broken cities. Likewise the US Marines aren’t certified as Riflemen and given highly accurate assault-rifles so they can stand around and oversee aid distributions. Any humanitarian operation they engage in is a secondary skill-set. Mixing forces designed and honed for extreme, precise violence with humanitarians whose sole purpose is to distribute assistance to survivors of disasters is not necessarily a healthy combination. Legacy. There is often a historical link between an army providing assistance, and the country they are operating in. More often than not this is because the country sending the army has a foreign-policy interest in the country they are assisting. This is plainly obvious in Iraq and Afghanistan, where US and British forces both carry out ‘humanitarian’ assistance missions (it’s important to note the deliberate misuse of the word ‘humanitarian’, which carries with it connotations of neutrality and seperation from parties to conflict). Likewise in Haiti, the US military has been complicit in affecting domestic politics, particularly under the Clinton regime when US pressure and military engagement helped to re-enstate then-recently-deposed President Aristide. NGOs associating with military forces automatically attract this same historical baggage. Humanitarian Space refers to the notional and academic seperation between humanitarian agencies and military actors, to ensure that observers can clearly differentiate between the two. The fear among NGOs is that with the destruction of that space (by NGOs working alongside uniformed military, or by military forces refering to their operations perversely as a “Humanitarian Mission”), observers (particularly those who carry guns or drive vehicle-borne improvised explosive devices) will fail to draw that distinction. We point to a growing list of serious security incidents carried out not just by bandits but by politically-motivated military and para-military forces who identify the international aid community with a Western invasion of their homeland and culture- the bombing of the UN compound in Iraq, the kidnapping and/or killing of numerous aid workers in Afghanistan, Iraq, Somalia and Darfur, and the bombing of the World Food Program headquarters in Pakistan late last year, to name just a smattering. To balance the above we must recognize that aid agencies don’t help themselves by frequently espousing a very western view of multiparty democratic form of government touted by the same governments carrying out military invasions in some of these countries. Agencies themselves can carry out culturally insensitive and alienating project work- sensitive topics in conservative societies include female education or sexual health. Likewise, western agency staff can make themselves targets of extremists through personal behavious such as ostentatious lifestyles in the face of extreme poverty, dress-codes, or the consumption of drugs and alcohol. I’m pretty sure that aid workers don’t deserve to get shot, blown up or beheaded for this, but it does set them up as figureheads of a western imperialistic regime which observers have come to hate but can’t find another way to strike at. Ultimately, the decision whether or how to work with the military must espouse this balance between ethical principles and the pragmatic need to support people in need. It needs to balance short-term gains with long-term strategy. It must not be reactive, based on unfounded fear or knee-jerk reactions to perceived insecurity and cultural differences. It must be based on careful context analysis and a thoughtful, engaged decision-making process. Of course, in the midst of a chaotic emergency response operation, where information is scant and changing every half-hour, and staff are stretched to capacity already, this care and deliberation is not always possible, and grace in the process is necessary. The Humanitarian Principle- the need to save lives- is always our number one priority. However where possible, thoughtful balance needs to be our approach. There is room for compromise. Using MINUSTAH forces rather than US Marines will be a far more palatable option in Port-au-Prince. Soldiers providing route security (i.e. running patrols on specific transit corridors to limit the chances of violence) is preferable to directly escorting food convoys with Light Armoured Vehicles. Foreign troops supporting national army and police forces to re-establish order and control in neighbourhoods is better than having armed footsoldiers with M16s standing guard by sacks of grain at a food distribution. By establishing good relations with community members, clear communication with and registration of recipients prior to a distribution, and establishing a clear and well-organized distribution site will go a long way to minimizing the chance of violence. Crowd control may well be possible using a couple of uniformed hired guards armed with nothing more than a baton and a walkie-talkie (I’ve seen less than this controlling crowds of ten thousand and more in camps in Darfur). This won’t stop malicious interference by armed gangs. But then, if you have the community on-side, they can go a long way to minimising the chances of this sort of event taking place. All that in an ideal world. The important thing is that the debate between pragmatism and principle takes place, and that well-founded ethical positions fought for over decades of bitter experience are not flushed in the name of getting a few good shots of your particular brand of aid agency handing out timely food parcels to starving masses. Good luck to those on the ground trying to navigate this particular minefield. My posting on Haiti last week (and the resulting spot on WordPress’s homepage, editorial in The Age, etc. etc.) provided a couple of fun side-effects. As well as the upswing in traffic on this site (thanks for the 12,000 of you who sauntered round for a gander last week), it also linked me in a little more to some of the other blogs and websites out there discussing the ins, outs, ups, downs and general architecture of humanitarian assistance. Some highlights for those interested in getting some more in-depth analysis around some of the issues that make aid work complex, fascinating, engaging, and periodically dysfunctional are linked below. On why we should think twice about how best to engage with military actors in protecting aid delivery, check out this article on J.’s [fantastic, insightful and frequently humorous] blog Tales From the Hood. On what to do to help the people of Haiti, what not to do, and why, check out these punchy points from J., and also some thoughtful analysis from Saundra Schimmelpfennig in her string of posts about choosing a charity to give to, why admin costs should not be the deciding factor in which agency you donate to, and why Haiti doesn’t need well-meaning volunteers. Aid worker and blogger Alannah Shaikh has also been getting some great coverage on her article explaining what Haiti does not need right now. Some added insight into the ins and outs of logistics and complexity as related to the Haiti quake, aid logistician Michael Keizer gives a great overview here. He also gives a good response to my earlier post on the economics of Search and Rescue teams. Michael and Alannah have both written good responses to an article in the Lancet criticising the aid industry, which you can read here and here, while AidWatch, a site dedicated to holding humanitarians accountable to best aid practice, has their own response here. And finally J. adds his two or three cents on what needs to follow the initial frenzy of digging people out of the rubble. On a completely different (non-Haiti-related) tack, I stumbled across an article written about a year ago entitled The Archipelago of Fear, a personal and insightful account of the dichotomies of life in Kabul as an expatriate. Long, but full of vivid emotion and tight, evocative prose. Highly recommended. Edit 25.01.10: For a great overview of some of the more relevant alternatives for how to help Haiti become a better place after reconstruction, check out Paul Currion’s commentary on Reinventing Haiti. NGOs need to start taking some of these more non-traditional approaches to reconstruction and rehabilitation more seriously.